Edward Corrigan settled on land in the general area of what is now Batehaven and Catalina in the mid 1800’s – subsequently the beach nearby was named ‘Corrigans Beach’. The early settlers would probably be amazed at the developments in and around Corrigans Beach today. The northern end of the beach, accessed directly off Beach Road, is flanked by playing fields, Birdland Animal Park, boat club and tennis courts. The northern headland is home to the Coast Patrol Rescue building and two concrete boat ramps. Located safely behind the Hanging Rock breakwall – a good spot for fishing. The middle area of the 2 kilometre-long beach is Corrigans Beach Reserve – a large grassy foreshore area with jet-ski launch area and full amenities. These include a choice of wood and gas barbecues, children’s playground and toilets. Corrigans Beach is definitely a family destination the original Corrigan family would be very proud of. 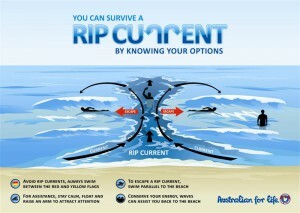 If you are unsure of conditions, ask a life saver. Don’t run and dive in the water. If you get in to trouble in the water, don’t panic – signal for help, float and wait for assistance. Wear a minimal 15+ sunscreen, plus a shirt and a hat. RELAX: Stay calm and float, do not swim against the current swim across it. RESCUE: Float and wait for assistance. Do not panic – people drown in rips because they panic. Obey directions from the rescuer. Darker colour, indicating deeper water. Murky brown water caused by sand stirred up off the bottom. A rippled look when the water around is generally calm. An excellent beach for children with well-placed play equipment overlooking the beach and covered picnic area. Toilets at both ends of the beach but limited space for parking. Access to beach carpark off Beach Road; note no parking along Beach Road. Enclosed on both sides by tall headlands, a small, sage pebble beach with character and colour. From white, brown and ochre yellow boulders to iridescent green moss on fallen trees, colour is everywhere. No amenities. The most northerly of a string of three surf beaches separated by tall headlands and rock platforms. Although located in a reasonably built up area, much of the original natural bush setting remains, giving you a sense of relaxation and escape. Drinking water and some seating but no other amenities. The beach with just about everything – surf, shops, amenities, children’s playground and loads of wide open space. The very large carpark features a takeaway café at the northern end, tall Norfolk Island pines along the perimeter and covered picnic tables set into the foreshore. An easy walk to Denhams Beach or Wimbie Beach. Surf Beach is patrolled in the peak periods only. A small beach that has retained a natural Australian bush feel despite development around it. No amenities but a good beach to walk the dog – note that time-share conditions apply. The starting point for bushwalkers heading south via beaches and headland reserves. Amazing pebble beach hidden away in thick bushland north of Lilli Pilli. An abundance of birdlife, tall spotted gums and a ground cover of burrawangs make you feel like you’re in a national park. Good for bushwalking, no amenities. A small, private, secluded beach with limited access. Interesting rock ledges and small pebbly coves nearby. No amenities. Secluded small beach with high bush canopy that all but hides the surrounding development. Park at southern end with children’s playground, barbecues, toilets and picnic tables. Several small pebbly coves at the southern end. A small pebble and sand beach that is the centre of fishing and boating for the area. Concrete boat ramp, cleaning bench and well-located café make it a good beach to watch the world go by. Full amenities including toilets, public telephone and large carpark. Excellent family beach with large picnic area and Children’s playground overlooking small pebbly beach. No toilets. Large surf beach with all amenities including the Batemans Bay Surf Life Saving Club and shopping centre opposite. Interesting rock formations at the southern end and huge foreshore reserve make this a beach that everyone will enjoy amenities at the northern end. For detail patrol dates and times, please follow this link. Very small, secluded bay with shallow clear waters. Rock platforms continue around Pretty Point past a stunning variety of coloured rocks. No Carpark or amenities. Rugged surf beach with little surrounding development and no amenities. Wide, flat rock ledges surround the headlands with numerous small rockpools. Kilometre-long, wide beach with plenty of space, surrounded by tall native trees and the quiet village of Rosedale. Good walks to the north and south to other beaches and a good view of Jimmies Island to the south. No amenities. Isolated small cove on the southern edge of the Rosedale Beach southern headland. Walk in from Rosedale Beach past Jimmies Island. Tall cliffs and forest with minimum development give the beach a serene, peaceful atmosphere. No amenities. Walk in from Guerilla Bay through tall spotted gum forest. Small, secluded beach set well back between two high headlands, popular with bushwalkers and off the beaten track. No amenities. Rugged beach surrounded by thick bushland and the village of Guerrilla Bay. Northern section of the beach is dominated by a large rock ‘Guerilla Rock’ that provides protection for swimmers. A popular destination for scuba divers and snorkelers. Good bushwalk on nearby Burrewarra Point through old forest and remains of WWII radar station. No amenities but small carpark and picnic tables at northern end of Beach Parade. Very protected small beach adjacent to the Cullendulla Creek Nature Reserve. Ideal for children but no amenities other than picnic area at western end. Small shopping centre located near the middle of the beach. A good family beach with a wide grass reserve and all amenities including disabled toilets, electric barbecues and boat ramp. Small cove at the western end offers sheltered rockpools for children to explore. Over 2 kilometres long beach with wide bush foreshore along most of its length. A natural boat ramp at the eastern end and picnic tables but few other amenities. Dog walking and horse riding allowed at western end of the beach.